A critical drama about an Israeli expatriate in Paris wrestling with his identity, "Synonyms" by director Nadav Lapid, won the Golden Bear top prize at the Berlin film festival Saturday. Lapid said the sexually explicit, semi-autobiographical movie, which deals with a young man who has fled Israel over its fraught political situation, might "scandalise" many in his home country as well as France. "First of all, it's a human and existential and artistic statement. The film is also a celebration and a party, a celebration of cinema." The runner-up jury prize went to French filmmaker Francois Ozon for "By the Grace of God", a wrenching drama based on real-life survivors of rampant sexual molestation in the Catholic church. "The film tries to break the silence in powerful institutions," he said. "I want to share this prize with the victims of sexual abuse." Ozon noted that the film's release in France, scheduled for next week, was facing a legal challenge, which he blasted as an attempt at "censorship". The stars of moving Chinese epic "So Long, My Son", Wang Jingchun and Yong Mei, about the lasting impact of the country's now abandoned one-child policy, shared the Silver Bear top acting prizes. "This is the tragedy of a woman, a family that loses its son," Yong said as she picked up her trophy. "We were happy we were able to complete the film." Binoche had earlier expressed "regret" that another Chinese film, veteran Zhang Yimou's "One Second", was pulled from the competition reportedly due to official censorship. "Zhang has been an essential voice in international cinema," she said. "We need artists who help us make sense of history." 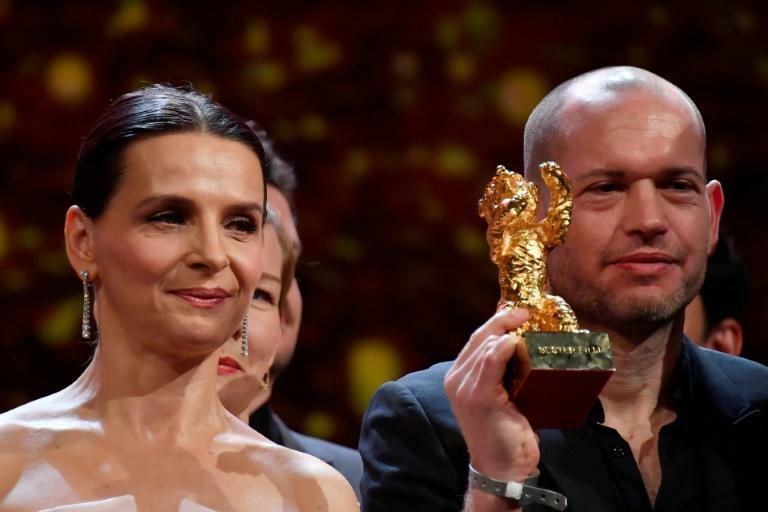 German filmmaker Angela Schanelec, one of a record seven women out of 16 contenders in competition, won the best director prize for "I Was At Home, But", a drama about a teenager who returns after a week-long disappearance to his mother, a grieving widow. "Piranhas" by Italian director Claudio Giovannesi about the youth of Naples being indoctrinated at ever earlier ages into the mafia won best screenplay. Roberto Saviano, who co-wrote the script based on his book "La Paranza dei Bambini", dedicated the trophy to NGOs working to save the lives of refugees in the Mediterranean. "Telling the truth has become very complex in our country so thank you," he said. The awards ceremony at the 69th Berlinale began with a tribute and standing ovation for the late Swiss actor Bruno Ganz, who starred in iconic German films such as "Downfall" in which he played Adolf Hitler and Wim Wenders's "Wings of Desire" set in divided Berlin. "Synonyms" is the third feature by Lapid, whose previous film "The Kindergarten Teacher" has been remade in the US starring Maggie Gyllenhaal. He tells largely disinterested Parisians that he has left Israel to get away from a country that he finds "repugnant, fetid, obscene, vulgar" –- words that help give the film its title. US website Indie wire called the movie a "wilfully confrontational satire that pugnaciously mocks his own Israeli identity; the culture of France, where Lapid lived at the start of this century; and assorted conventions and decorums of art cinema".